These cute princess dream of a prince. Here you have to go through a fun quiz to create the perfect couple. Be very attentive and try to answer questions correctly. Are you able to do that? Then just go ahead! 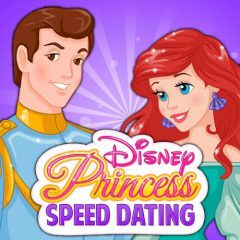 For busy princes and princesses from Disney, speed dating is the best way to get to know the most beautiful people in the kingdom in a short time. They can’t meet and talk for several weeks, they are young and eager to marry soon and start their royal family. With a quick checklist, answer the quiz to find your perfect match.